Around the World in 80 Days (sometimes spelled as Around the World in Eighty Days) is a 1956 American epic adventure-comedy film starring Cantinflas and David Niven, produced by the Michael Todd Company and released by United Artists. The epic picture was directed by Michael Anderson and produced by Mike Todd, with Kevin McClory and William Cameron Menzies as associate producers. The screenplay was written by James Poe, John Farrow, and S. J. Perelman based on the classic novel of the same name by Jules Verne. The music score was composed by Victor Young, and the Todd-AO 70 mm cinematography (shot in Technicolor) was by Lionel Lindon. The film's six-minute-long animated title sequence, shown at the end of the film, was created by award-winning designer Saul Bass. The film won 5 Academy Awards, including Best Picture. In 1872, an English gentleman Phileas Fogg (David Niven) claims he can circumnavigate the world in eighty days. He makes a £20,000 wager (worth about £1.8 million in 2015) with four sceptical fellow members of the Reform Club (each contributing £5,000 to the bet) that he can arrive back eighty days from exactly 8:45 pm that evening. Together with his resourceful valet, Passepartout (Cantinflas), Fogg goes hopscotching around the globe generously spending money to encourage others to help him get to his destinations faster so he can accommodate tight steamship schedules. They set out on the journey from Paris by a gas balloon named La Coquette upon learning the mountain train tunnel is blocked. The two accidentally end up in Spain, where Passepartout engages in a comic bullfight. Next, he goes to Brindisi. Meanwhile, suspicion grows that Fogg has stolen £55,000 (around £4.8 million today) from the Bank of England so Police Inspector Fix (Robert Newton) is sent out by Scotland Yard to trail him (starting in Suez) and keeps waiting for a warrant to arrive so he can arrest Fogg in the British ports they visit. In India, Fogg and Passepartout rescue young widow Princess Aouda (Shirley MacLaine) from being forced into a funeral pyre with her late husband. The three visit Hong Kong, Yokohama, San Francisco, and the Wild West. After sailing across the Atlantic, and only hours short of winning his wager, Fogg is arrested upon arrival at Liverpool, by the diligent yet misguided Inspector Fix. At the jail, the humiliated Fix informs Fogg that the real culprit was caught in Brighton. Although he is now exculpated, he has insufficient time to reach London before his deadline and thus has lost everything – but the love of the winsome Aouda. Salvation is at hand when, upon returning to London, Passepartout buys a newspaper and sees it is still Saturday. Fogg then realizes that by traveling east towards the rising sun and by crossing the International Date Line, he has gained a day. There is still time to reach the Reform Club and win the bet. Fogg arrives at the club just before the 8:45 pm chime. Aouda and Passepartout then arrive, surprising everyone, as no woman has ever entered the Reform Club before. The film boasts an all star cast, with David Niven and Cantinflas in the lead roles of Fogg and Passepartout. Fogg is the classic Victorian gentleman, well-dressed, well-spoken, and extremely punctual, whereas his servant Passepartout (who has an eye for the ladies) provides much of the comic relief as a "jack of all trades" for the film in contrast to his master's strict formality. Joining them are Shirley MacLaine as Princess Aouda and Robert Newton as the detective Fix, in his last role. More than 40 famous performers make cameo appearances, including Marlene Dietrich, Ronald Colman, George Raft, and Frank Sinatra. The film was significant as the first of the so-called Hollywood "make work" films, employing dozens of film personalities. John Wayne turned down Todd's offer for the role of the Colonel leading the Cavalry charge, a role filled by Colonel Tim McCoy. Promotional material released at the time quoted a Screen Actors Guild representative looking at the shooting call sheet and crying: "Good heavens Todd, you've made extras out of all the stars in Hollywood!" As of 2019, Shirley MacLaine and Glynis Johns are the last surviving members of the entire cast. Around the World in 80 Days was produced by Michael Todd, a Broadway showman who had never before produced a film. The director he hired, Michael Anderson, had directed the highly acclaimed British World War II feature The Dam Busters (1955), George Orwell's Nineteen Eighty-Four feature (1956), and other classic films. Todd sold his interest in the Todd-AO format to help finance the film. Because Todd-AO ran at 30 frames per second, which was incompatible with the 35mm standard of 24 fps, Around the World in 80 Days was filmed twice, like the first feature in Todd-AO, Oklahoma!. Unlike Oklahoma!, however, which was filmed additionally in 35mm CinemaScope, Around the World in 80 Days was filmed simultaneously in Todd-AO at 24 frames per second so that from this negative, 35mm reduction prints could be produced for general release. After these two films, the specification for Todd-AO was altered after the third film in the format, South Pacific, to 24 fps running, making it unnecessary to film subsequent productions twice. In his 1972 autobiographical book The Moon's a Balloon, actor David Niven discussed his meeting with Todd and the subsequent events that led to the film being produced. According to Niven, when Todd asked him if he would appear as Fogg, Niven enthusiastically replied, 'I'd do it for nothing!' He later admitted to being grateful that Todd did not hold him to his claim. He also described the first meeting between Todd and Robert Newton (who suffered from drinking problems) when the latter was offered the role of the detective, Fix; Niven alleged that Newton was offered the part on condition that he did not drink any alcohol during the filming, and that his celebration following the completion of his role led to his untimely demise (he did not live to see the film released). Todd sometimes used models of boats, ships, and trains in the film, but he often decided that they didn't look realistic so he switched to the real thing where he could. The scene of a collapsing train bridge is partly without models. The overhead shot of a train crossing a bridge was full scale, but the bridge collapse was a large-scale miniature, verifiable by observing the slightly jerky motion of the rear passenger car as the train pulls away, as well as the slowed-down water droplets which are out of scale in the splashing river below. All the steamships shown in the first half are miniatures shot in an outdoor studio tank. The exception is the American ship shown at the intermission point, which is real. A tunnel was built for a train sequence out of paper mache. After the train filming was complete, the "tunnel" was pushed over into the gorge. In his memoirs, Niven related that Todd completed filming while in considerable debt. The post-production work on the film was an exercise in holding off Todd's creditors long enough to produce a saleable film, and the footage was worked upon under the supervision of Todd's creditors and returned to a secure vault each night, as if it were in escrow. The film premiered on October 17, 1956 at the Rivoli Theater in New York City and played to full houses for 15 months. It ran for 102 weeks at the theater, with 1,564 performances, 2,173,238 patrons and a gross of $4,872,326. By the time of Todd's death in a private plane crash, 18 months after the film had opened, it had grossed $33 million. Bosley Crowther called the film a "sprawling conglomeration of refined English comedy, giant-screen travel panoramics and slam-bang Keystone burlesque" and said Todd and the film's crew "commandeered the giant screen and stereophonic sound as though they were Olsen and Johnson turned loose in a cosmic cutting-room, with a pipe organ in one corner and all the movies ever made to toss around". Time magazine called it "brassy, extravagant, long-winded and funny" and the "Polyphemus of productions," saying "as a travelogue, Around the World is at least as spectacular as anything Cinerama has slapped together". Time highlighted the performance of "the famous Mexican comic, Cantinflas [who in] his first U.S. movie ... gives delightful evidence that he may well be, as Charles Chaplin once said he was, "the world's greatest clown". The review aggregator website Rotten Tomatoes retrospectively collected 38 reviews and gave the film an aggregate score of 71%, with a rating average of 6/10, with the site's consensus stating: "It's undeniably shallow, but its cheerful lack of pretense -- as well as its grand scale and star-stuffed cast -- help make Around the World in 80 Days charmingly light-hearted entertainment". Although not nominated for best original song, the film's theme song "Around the World" (music by Victor Young, words by Harold Adamson), became very popular. It was a hit for Bing Crosby in 1957, and was a staple of the easy-listening genre for many years: "Around the world, I searched for you / I traveled on when hope was gone to keep a rendezvous ... No more will I go all around the world / For I have found my world in you." It is also one of the few Best Picture winners not to be nominated in any acting category. CBS paid Mike Todd for the rights to cover the anniversary celebration as a television special. Todd and his wife Elizabeth Taylor are seen here at home in a film clip which was used for the television special. The film was originally distributed by United Artists in two Todd-AO 70 mm versions, one for Todd-AO 70 mm release at 30 frames per second, and an alternative 70 mm version at 24 frames per second reduced to 35 mm for general release. 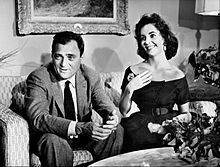 Around 1976, after its last network television broadcast on CBS, UA lost control of the film to Elizabeth Taylor, who was the widow of producer Michael Todd and had inherited a portion of Todd's estate. In 1983, Warner Bros. acquired the rights to the film from Taylor, and reissued the film theatrically in a re-edited 143-minute version (this version would subsequently air only once on Turner Classic Movies, this was before any restoration on the movie was announced). In the years that followed, a pan-and-scan transfer of the alternative 24 frame/s version (presented at its full 183-minute length) was shown on cable television. Best available prints of the 30 frame/s/70 mm version have recently[when?] been exhibited in revival movie houses worldwide. As of the present time, WB remains the film's rights holder. During the 1970-80s, the Alton Towers theme park in England had a boat ride based on the film. ^ a b c d e f "Cinema: The New Pictures". Time. October 29, 1956. Retrieved October 1, 2010. 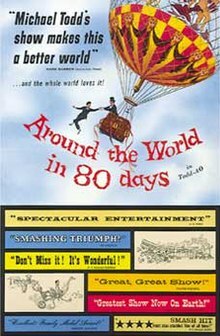 ^ a b "Around the World in 80 Days (1956)". Box Office Mojo. IMDB. Retrieved March 2, 2013. ^ Wolfe, Jennifer (January 6, 2016). "'Yellow Submarine' Animation Director Robert Balser Passes at 88". Animation World Network. Retrieved February 1, 2016. ^ Award Wins and Nominations for Around the World in 80 Days. IMDb. Retrieved March 2, 2013. ^ Dirks, Tim. "A Trip to The Moon". Filmsite.org. Archived from the original on January 17, 2007. Retrieved January 8, 2007. ^ "La Coquette – Making of a Movie". Tony Fairbanks, a written and visual archive. Retrieved July 20, 2018. ^ Freese, Gene Scott (April 10, 2014). Hollywood Stunt Performers, 1910s-1970s: A Biographical Dictionary (2nd ed.). McFarland & Company. p. 75. ISBN 9780786476435. ^ a b c "Cinema: The Showman". Time. March 31, 1958. Retrieved October 1, 2010. ^ "When Hollywood Came Calling!". The Daily Star. November 5, 2018. ^ Turner Classic Movies introduction to the film, February 10, 2019. ^ "Movie Magic and Illusions Take You – Around The World IN 80 Days." Popular Mechanics, August 1956, pp. 65-69/226. ^ a b Crowther, Bosley (October 18, 1956). "Mammoth Show". The New York Times. Retrieved October 1, 2010. ^ "NY Rivoli Run Summary". Variety. October 8, 1958. p. 7. Retrieved March 10, 2019. ^ "Around the World in 80 Days". Retrieved August 16, 2016. ^ "Cantinflas". September 18, 2014. Retrieved August 16, 2016 – via IMDb. ^ New York Times, Academy Awards. ^ "Festival de Cannes: Around the World in 80 Days". festival-cannes.com. Retrieved February 9, 2009. ^ Cohn, Art (November 25, 1958). "Mike Todds' last Coup". Beaver Valley Times. Retrieved July 6, 2014. ^ Goodman, Fred (2015). Allen Klein: The Man Who Bailed Out the Beatles, Made the Stones, and Transformed Rock & Roll. Boston, New York: Houghton Mifflin Harcourt. pp. 27–28. ISBN 978-0-547-89686-1. ^ "Dell Four Color #784". Grand Comics Database.